Montana communities depend on revenue from oil and gas companies to fund important services like our schools. Yet, through policy decisions by the state legislature, Montana has given oil and gas production companies major tax breaks that have cost the state millions in lost revenue that could have been used to invest in our communities. In 1999, the legislature created a tax break for oil and gas companies that lowers the taxation of oil and gas production during the most profitable period of extraction. At the time, proponents of the tax break claimed that it would encourage economic development in Montana’s resource-rich areas - a claim unsupported by the facts. In reality, oil and gas companies operate where there is oil and do not base their decisions on state taxes, which are just a small fraction of their total costs. This tax break has cost the state and communities impacted by resource extraction tens of millions of dollars each year. The most recent boom and subsequent bust in natural gas and oil production has created an increased strain on public services and structures. Rather than maintaining needed services like education, public sewers, water systems, and good roads that would help Montana retain and grow jobs, the money was instead given to oil and gas companies as a tax break. 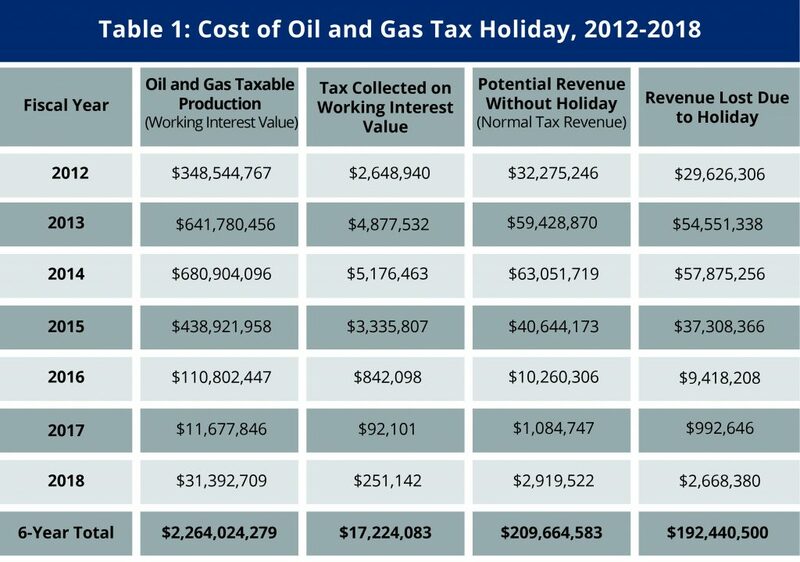 In short, the oil and gas tax holiday is ineffective and has cost Montana millions in revenue for public services and infrastructure. Now those Montana communities that grew quickly are hurting during this time of transition. It is time to take a hard look at the effectiveness of this tax break. A tax on oil, gas, or other resource extraction is called a severance tax because it is a tax on severing a nonrenewable resource from the earth. In other words, this tax applies to resources that we cannot recover or use again. Severance taxes reimburse communities for the permanently reduced value of their land. There is broad agreement today that the severance tax represents good tax policy: private companies should compensate Montana for irreversibly removing and profiting off state natural resources. Severance taxes are based on the value of the resources extracted. The value of the resource varies with the price of the resource and therefore so does the amount of severance tax collected. In Montana, the severance tax on oil and gas extraction is called the oil and gas production tax. Taxing oil and gas at a lower rate at the beginning of production is particularly problematic because wells produce significantly higher amounts at the beginning of their lifetime. The following graph shows the average daily production of oil in the Bakken Oil Fields. In a six-year period, from 2012 to 2018, the tax holiday cost the state and counties $192 million in revenue (Table 1). Revenues are split approximately 54/46 between the state and counties, and approximately 90 percent of the state’s share goes to the state General Fund, used to help pay for public services like schools, roads, and bridges. Consequently, the General Fund lost approximately $93.5 million over the six-year period. Local governments experienced a loss of $88.5 million. The cost of the holiday to the General Fund for the 2017 biennium is estimated to be $22.7 million. Over the same time period, counties are expected to have lost almost $21.5 million. The issue of lost revenue is especially important in the communities that have felt the greatest impact of the oil and gas boom. In Eastern Montana, the development of the Bakken region has meant over-burdened schools, a strained police force, heavy use of local roads, and little to no affordable housing. However, because of the tax holiday, local counties and cities do not receive the revenue they need to meet the increased infrastructure and service demands during the initial period of drilling, the time when the community feels these impacts the most. Furthermore, “spillover counties” that have little to no oil and gas production, but feel the effects of increased demands on their housing, roads, and school systems, are not receiving the funding they need because the distribution formula does not direct funds to spillover counties. One argument used to justify the oil and gas tax holiday has been that it will encourage more development; however, a comparison of the effective tax rates of our neighboring states casts doubt on that claim. While actual tax rates vary due to numerous factors - like the length of time a well has been in operation - the effective rate is the average tax rate paid on all extraction. Montana’s effective rate of taxation on a typical oil well is 7.6 percent, significantly lower than both Wyoming’s 11.7 percent and North Dakota’s 11.3 percent. Yet Wyoming and North Dakota have higher total production volume. In 2017, Wyoming produced 75,669,000 barrels of oil, North Dakota produced 392,127,00 barrels, while Montana produced 20,706,000 barrels of oil. In other words, the amount of production does not appear to be related to the effective tax rate. Likewise, when comparing tax rates over the lifetime of a typical well in the Bakken formation, North Dakota has a tax rate of 10.6 percent, higher than Montana’s rate of 7.4 percent. Despite this higher tax rate, North Dakota still ranked in the top five of oil and gas producing states in 2011 during the last energy boom. Montana, however, did not. Although North Dakota also has an oil and gas tax holiday, it does not go into effect unless oil prices are below $88.46 per barrel, preserving revenue for the state when production value is high. The evidence continues to mount that repealing the oil and gas tax holiday would not harm, and may actually help, the Montana economy. Three studies in particular are relevant when considering the impact the holiday has had on Montana’s economy. The Montana-based Headwaters Economics’ historical analysis of Montana’s tax shows that lower rates have not improved the production in Montana relative to other states. Montana had the smallest growth in production of the five Intermountain states studied after reducing the state’s oil and gas rates in 1999. Montana production grew by $2 billion between 2000 and 2006, while production in Wyoming, with a tax rate 50 percent higher, grew by $10 billion during the same period. 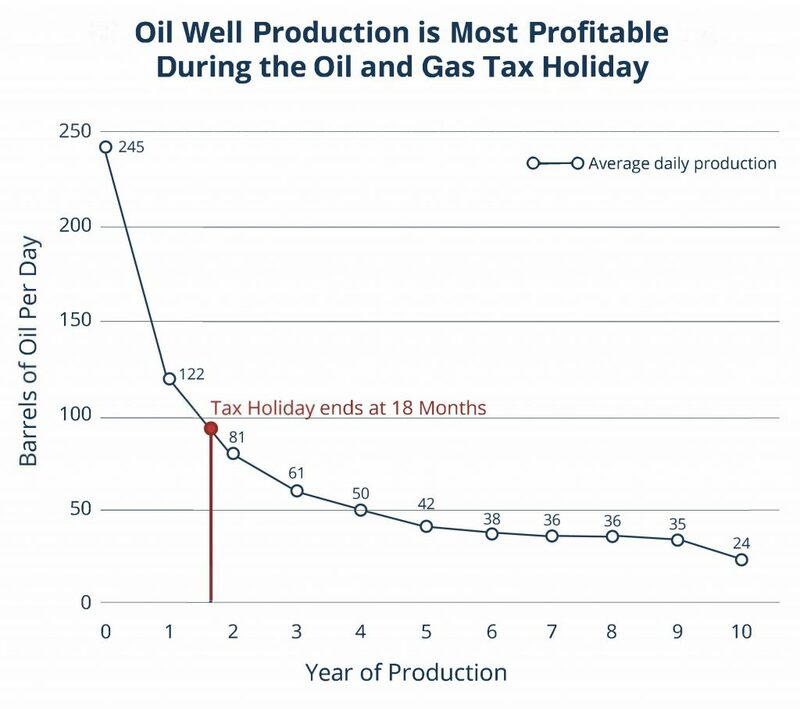 University of Utah Professor of Economics Gabriel Lozada studied Utah’s exemptions on oil and gas for development of new wells, and found that eliminating the tax holiday for new wells would result in a less than 1 percent reduction in new wells. However, severance tax collections would increase by 15-16 percent. He asserts that because the additional tax revenue dollars would be spent on other activities within the state, there should be no reduction in economic activity in the state. A study commissioned by the Wyoming legislature of Wyoming’s oil and gas tax rate found that tax decreases would lead to a very small increase in the number of wells and a large decrease in the amount of revenue to the state. It is not surprising that oil and gas taxes have little effect on the amount of resources extracted in a state. Both common sense and research tell us that oil and gas companies will operate where there is oil and will not base decisions on state taxes, which are a small fraction of their total costs and profits. Greater disparity in household income levels. These counties still need jobs, and oil and gas will continue to be part of the mix. But giving these resources away means forgoing other investments that will lead to sustainable prosperity. Responsible taxation retains jobs (the booms will still come), but it will also allow oil and gas counties to better weather the busts and begin diversifying their economies. 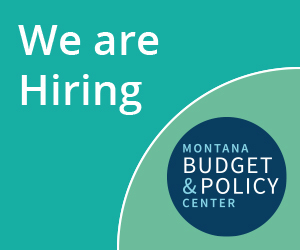 While Montana’s revenue sources are more diverse than many surrounding states that are heavily reliant on natural resource taxes, declines in production have negatively impacted revenue to the general fund., Oil production in Montana has been declining since 2015, due to a dramatic drop in oil prices, from $80 a barrel in 2014, to just under $50 in 2017.,  This drop in production and price will cause a decrease in revenue to the General Fund in coming years. In 2014, oil and gas tax revenue contributed nearly $110 million to the General Fund, then dropped to $73 million in 2015 and $39 million in 2016. According to Legislative Fiscal Division, the General Fund saw contributions of $54.5 million in 2018— an increase from previous years but still an amount that does not approach the boom time years. Furthermore, the decrease in oil prices is also likely to decrease individual and corporate income tax revenue, as well as U.S. mineral royalties. Currently, there are no drilling rigs operating in the state, and due to the oil and gas tax holiday, new production would be unable to help increase revenue to General Fund in the next few years, as these wells would pay very little for their first 18 months of operation. Repealing the oil and gas tax holiday, coupled with establishing an oil and gas trust fund (see below), could help Montana protect against future downturns such as this one. Montana gives away more in tax expenditures than neighboring oil and gas producing states, nearly $1 million per unconventional oil well over the course of ten years. The tax holiday accounts for over half of this. Conversely, North Dakota puts $930,680 over ten years per unconventional oil well into trust funds to help protect against bust cycles. Due to the decrease in oil prices, North Dakota has been experiencing significant budget shortfalls, causing their governor to make substantial cuts to the state’s agencies. However, some of this shortfall has been mitigated by use of the Budget Stabilization Fund, which is largely funded by oil taxes. Because North Dakota limits its tax holiday only to times when oil prices are very low and preserves a good portion of oil tax revenue through the long-term Budget Stabilization Fund, North Dakota can provide stable returns even during bust cycles. Revenue generated during boom cycles can then be available at the start of the next boom, helping to manage the increased needs of communities before tax revenue becomes available. The 2015 Montana Legislature voted against House Bill 310 that would have created an oil and gas trust fund for Montana. Tax policies that eliminate or delay revenue cause communities to play “catch up” when there is increase demand for services like roads, water, and sewer. Montana communities receive revenue from taxes 22 months after well completion – 18 months for the tax holiday period and the four months it takes to collect and distribute the taxes. Montana communities can help protect against the downturns caused by bust cycles and meet the demands during booms by repealing the tax holiday. Montana policymakers have several viable options for addressing the oil and gas tax holiday to use the resulting revenue to boost Montana’s economy to help affected communities deal with the impacts of oil and gas development. One possible solution is to repeal the holiday outright, which would simply ensure that newly drilled wells are taxed at the same rate as older wells. An alternative to completely repealing the oil and gas tax holiday is implementing a trigger price at which the holiday would go into effect. Creating this trigger would make Montana’s tax code more similar to North Dakota, which has a trigger set at $86.80 per barrel. If Montana adopts the same trigger, during periods of low oil prices, the oil and gas tax holiday would go into effect. Creating a trigger price at which the repeal goes into effect makes sure that Montana is fairly compensated for our resources when prices are high and oil companies are making significant profit off extraction, while at the same time allows us to remain competitive in the energy market when resource prices fall. In either case, repealing the oil and gas tax holiday or instituting a trigger could change the way Montana’s oil and gas revenues flow. Rather than benefitting large corporations, this revenue could benefit our state and communities. Proper investment of this funding could build the region for years to come by addressing both immediate and long-term needs. For example, a portion of the recovered revenues could be used to establish an Oil and Gas Trust Fund. This trust fund would help support the state by providing a sustainable revenue source to the state’s General Fund, similar to the Coal Tax Bond Fund, helping to fund our schools, improve our infrastructure, and support the economy. Additional revenue from the reform of the tax holiday could also help create an impact fund to support both spillover counties and counties whose oil and gas tax revenues are not sufficient to meet the rising service and infrastructure demands of the resource boom. By creating both an impact fund and a trust, the tax holiday repeal or trigger would help to address short- and long-term issues created by the oil and gas boom, while avoiding redirecting funds away from any of the current beneficiaries of the oil and gas production tax. This approach would ensure that the state General Fund, cities, and counties would not experience a reduction in their funding. Communities across Montana have lost millions of dollars through this exclusive tax break for oil and gas companies – money that could be invested in the local communities to create conditions for reliable, long-term development. Furthermore, research has shown that oil and gas tax breaks do not substantially influence the amount of drilling that occurs, and that drilling alone is not a reliable means to grow the economy over the long run. State taxes are unlikely to influence oil and gas companies’ decisions to drill new wells because companies have to drill where the oil exists, and state taxes are a small share of total productions costs. Montana cannot afford the oil and gas tax holiday. Our state would be better served by using these revenues to invest in communities where our children can learn, grow, prosper, and stay to raise their own families well into the future. Headwaters Economics, “Energy Revenue in the Intermountain West: State and Local Government Taxes and Royalties from Oil, Natural Gas and Coal,” Oct. 2008. Some have argued that the term “production tax” is a misnomer. See, for example, Lozada, G., “The Effect of Proposed 2009 Tax Changes on Utah’s Oil and Gas Industry,” Dec. 18, 2008. (“On a final note, “production” of oil and gas is in a sense a misnomer. Oil and gas were produced millions of years ago; none are produced today. The oil and gas industries extract these products today, and if their activity is reduced, more oil and gas will remain in the ground for future generations of Americans to use. So diminishing “production” of oil and gas from Utah today is properly understood not as decreasing the total amount of oil and gas ever extracted from the state, but instead as shifting extraction from today to the future.”). Rates apply to working interest entities on wells drilled after 1999. Entities with a working interest are those that do the work to extract the oil or gas from the ground. In addition to the working interest entity, there is the royalty interest entity that owns the mineral rights, but does not invest in the extraction. There is no tax holiday for royalty interest entities. Department of Revenue, “Biennial Report. July 1, 2016 – June 30, 2018,” Dec. 17, 2018. The current definition of newly drilled wells was created in 1999; severance tax rates were also lowered at that time from 12 percent on oil and 15 percent on natural gas to 9 percent on both. Mont. Code Ann., 15-36-304. Figures calculated from Department of Revenue’s Biennial Report July 1, 2016 – June 30, 2018. Based on 2015 and 2016 taxable production, total revenue lost due to tax holiday during the 2017 biennium was approximately $46.7 million. Kemmick, E., “The Bakken Boom,” The Montanan, Spring 2012. Headwaters Economics, “What Do Local Governments Receive from Oil and Gas Production Taxes?,” Dec. 2016. U.S Energy Information Administration, “Crude Oil Production,” 2017. Department of Revenue, “Oil and Gas Production Tax Comparison: Montana and North Dakota.” Nov. 8, 2012. U.S Energy Information Administration, “Five states accounted for about 56 percent of total U.S. crude oil production in 2011,” Mar. 14, 2012. The trigger is actually set at $90.96. North Dakota subtracts $2.50 from the West Texas Intermediate (WTI) price and compares this amount to the trigger. For simplicity, we are referring to the trigger as comparing the WTI price to the trigger plus $2.50. Office of State Tax Commissioner. “Annual Oil Trigger Price Adjustment,” Dec. 2018. Gerking, S. et. al., “Mineral Tax Incentive, Mineral Production and the Wyoming Economy,” Dec. 1, 2000. “As measured by average annual job growth, only one of 26 [energy-focusing] counties ranks among the top 30 economic performers in the West, while during the last energy boom half were top performers. In addition, more than half of EF counties are losing population in the midst of today’s energy surge.” Headwaters Economics. “Fossil Fuel Extraction as a County Economic Development Strategy: Are Energy-Focusing Counties Benefiting?” Sept. 2008. Headwaters Economics, “Fossil Fuel Extraction as a County Economic Development Strategy: Are Energy-focusing Counties Benefitting?,” Sept. 2008. Legislative Fiscal Division, “Historical Oil Production and Rigs in Montana by Calendar Year,” May 2016. Legislative Fiscal Division, “Oil Production and Price by Calendar Year,” Oct. 17, 2018. Legislative Fiscal Division, “2019 Biennium Outlook for the General Fund Budget,” June 16, 2016. Legislative Fiscal Division, “Montana’s Oil & Gas Production Tax,” Aug. 2018. Headwaters Economics, “How Montana Returns ‘Unconventional’ Oil Revenue to Local Governments,” Jan. 2014. Macpherson, J., “North Dakota governor orders cuts amid $1B budget shortfall,” Associated Press, Feb. 1, 2016. Rep. Jacobson, T., “Establish an oil and gas trust fund,” HB 310, Montana 64th Legislature, as introduced on Jan. 23, 2015. North Dakota Office of State Tax Commissioner, “Annual Oil Trigger Price Adjustment,” Dec. 2018.